You don't even have to boil the pasta, cook the chicken, or sauté the vegetables! 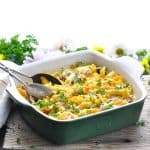 Just stir everything together and 10 minutes later you'll have a Dump-and-Bake Creamy Chicken Penne Pasta that's ready for the oven. It's a one pot meal that makes weeknight dinners easy! Preheat oven to 350 degrees F. Spray an 8-inch square baking dish with cooking spray and set aside. In a large bowl, whisk together condensed soup, milk, chicken broth, and pepper. Stir in onion, mushrooms, bell pepper, celery, raw chicken, uncooked pasta, and ½ cup cheese. Transfer mixture to prepared baking dish. Cover tightly and bake for 20 minutes. Remove foil and give everything a stir in the dish. Sprinkle remaining ½ cup of cheese over top. Return to the oven and bake, uncovered, for 30-40 more minutes, or until pasta is tender and chicken is cooked through. Cooking for a larger family? I recommend doubling all of the ingredients and preparing the casserole in a 9 x 13-inch baking dish. The baking instructions remain the same.